Home » Podcasts » The Pennie Tour in New Orleans! The Pennie Tour in New Orleans! Street, Superbowl winners New Orleans Saints, and the city’s distinct above ground tombs and voodoo – but who knew this city could be so much fun over the holidays???? holiday hours! The subtropical weather made the North Pole seem very far away. 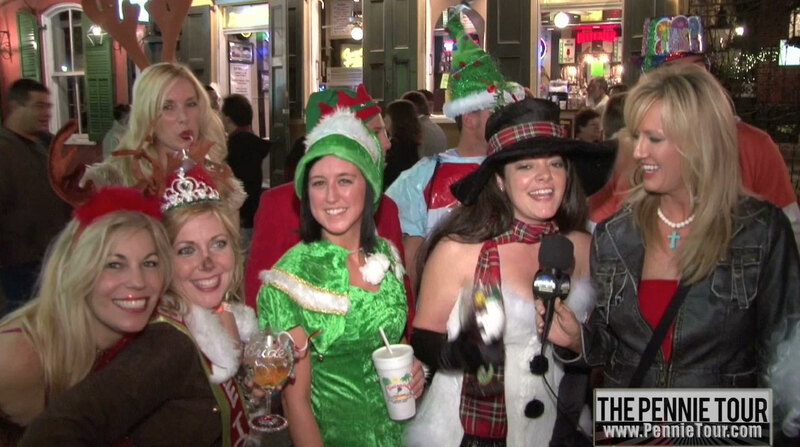 Mrs. Claus will need to pack a miniskirt for her next holiday visit to New Orleans! Famous for its cuisine, Pennie Tour wanted to find out the best Creole food New Orleans had to offer. Turtle Soup anyone? Pennie Tour also was on a quest to find the best Bloody Mary’s in the crescent city. What better complement to Creole food than a zesty Bloody Mary!! 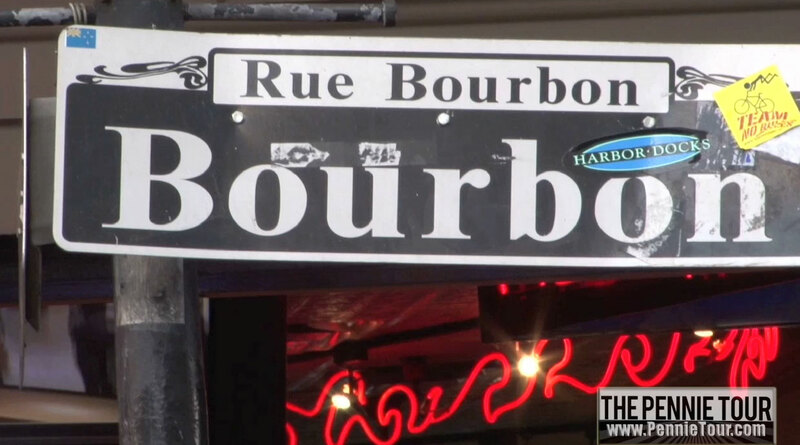 What will you see on Bourban Street? A parade – of course. Parades are almost a daily ritual. Pub crawls – you bet! 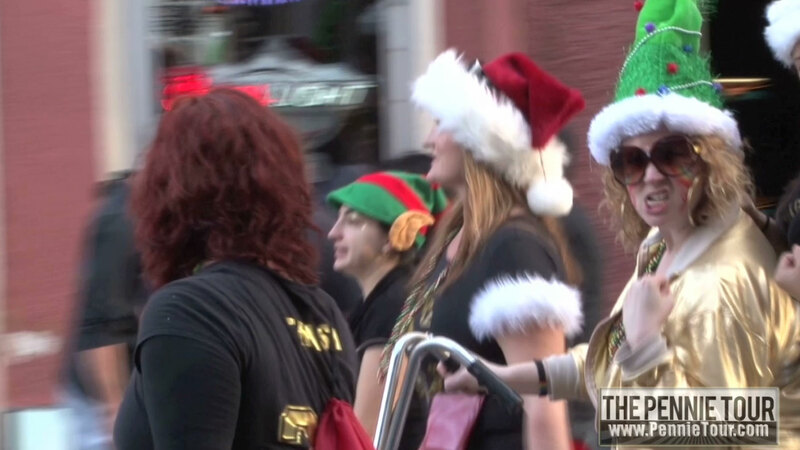 Krewe of Kringle is one of the many pub crawls during the holidays! As always, Pennie Tour loved the talented street performers and locals full of information about their beloved city. blues but have you heard of a jazz funeral? A spin on the tradition of military brass band funerals, traditional New Orleans funerals feature sad music on the way to the cemetery and happier jazz music on the way back. 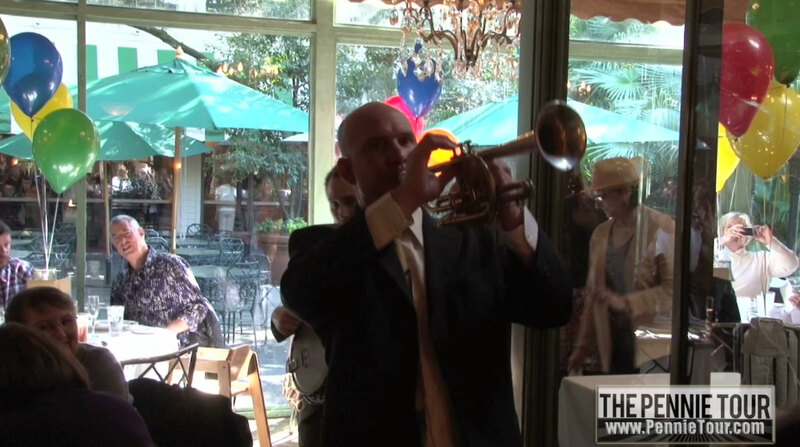 Sunday brunch at The Commander’s palace in the garden district, is the perfect place to experience the second line dance, as well as an exquisite assortment of local creole food and of course – one of the best bloody mary’s in town! New Orleans – a great holiday adventure!